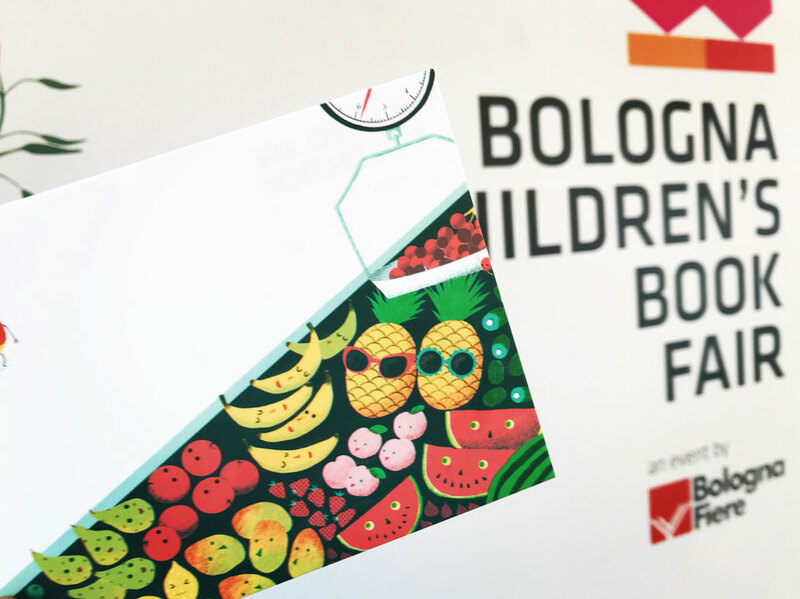 Last year I wrote a post called ‘A Beginner’s Guide to the Bologna Children’s Book Fair by a Beginner’ after my first BCBF. It concluded with me saying “I’m already thinking of the next year! I shall work on my books and come back!” And so I did! I worked on my book ideas for the last 12 months, made dummies and updated my portfolio, and I went back to the Bologna Children’s Book Fair 2018. I learned a lot from the overwhelming first time experience, and thanks to that, this year’s experience for me was more intense but much more fruitful. This is my BCBF guide part two if you may. In this post, I will write mostly about the things I learned from the last year and had implemented, so read the part one to get the complete idea. OK, let’s start with the topic many beginners care about the most. This year the Illustrators’ Survival Corner was insane! Every morning illustrators ran to the ISC desk to signed up for portfolio reviews and workshops as if their life depended on it. The morning madness was completely bonkers. It was like a scene from Hunger Game… ‘Survival Corner’, indeed! Even though my friends and I arrived at the fair way before the 9 a.m. opening every morning, we couldn’t sign up for almost anything. But don’t be discouraged. If you haven’t been able to secure appointments with publishers by email or at the Survival Corner, you can still try Open Portfolio Reviews hosted by publishers. Open Portfolio Reviews (OPR) are usually ‘first come first serve’ so you often end up queuing for an hour or more for each review. The longest I did this year was 2 hours. You don’t want to waste your precious time just to hear ‘Not for us’, so do your research. Prior to the fair, I did my research to see with which publishers my style would be compatible and made a wish list. It helped me to priotise and plan my days at the fair much better. In the past, I sent out hundreds of emails to publishers prior to the fair but I secured no appointment. This time, instead, I just followed my favourite publishers on Twitter / Facebook and watch out for their OPR announcements like a hawk. Closer to the fair opening, I spotted some announcements, which I applied, and I secured a couple of meetings! I’ve been a AOI member for about 2 years and they have been fantastic. They are always keen to help startup illustrators like me. For example, I secured a meeting with a big UK publisher thanks to AOI. Also, I submitted for the Bestseller magazine’s Illustrator Showcase, which I found out on the AOI news letter, and I was selected among other 7 talented illustrators! I was so chuffed to see my artwork on their special daily edition handed out at the fair. That was one of highlights of my week! I mentioned this in the previous post but I can’t help repeating how valuable it is. To make most of OPRs happening all over the huge venue, you will need extra hands (and eyes and legs). My friends and I created a WhatsApp group and shared information every time we saw / heard about a new OPR notice during the fair. We kept each other updated on when and where the reviews were happening, how long the queues were, who is reviewing, how they were etc. If you have a picture book idea, that’s great! Highly recommend to make a dummy book especially if you’re an artist who is crap at giving a pitch like me. Last year I got my dummies printed and bonded professionally and they cost me a good deal. But the fancy presentation didn’t fool publishers. Their reactions were mostly ‘meh 😕’ because my style and stories weren’t strong enough. At the end of the day it’s all about your ideas and artwork. So this year I just handmade my dummies with my home printer and a sticky stick. Of course I made them presentable as much as possible. And you know what? My dummies caught a few publishers’ attentions (in a good way)! The app was free to download. The event and exhibitor search function was very useful. You can find each event / exhibitor’s stand number and location on map quick n easy. The legendary Illustrators Wall is a popular place to leave your business cards and postcards to let the world know that you exist, and in the previous post, I said ‘Bring lots of business cards and postcards’. However, people love freebies, your cards ‘sell like hotcakes’ and you end up giving away hundreds of cards. It could be a bit of strain on poor illustrators like me. P.s. don’t forget to bring sticky tapes! I still brought some postcards and business cards though. But this time I only gave to publishers and people I met in person. If you are pitching a book idea to publishers, my tip is to use artwork from the dummy book on your cards to remind the publishers of the book later. If you can’t meet your favourite publishers in person, leave your cards at their reception desks. Some publishers even have a box for you to leave your cards. Also, during the long waiting game in OPR queues, you most likely will meet lovely fellow illustrators. Give your cards and make friends 😀 At the end, I gave away about 50 business cards and postcards this year. OPRs, workshops, masterclasses and exhibitions – there are overwhelming number of things to do during the 4-day fair. It’s important to be top of things. Make a list or own planner or whatever works for you to be organised. Also, make notes after each portfolio review of feedback and how to follow up. And note down names of publishers that have caught your eyes during the fair so you can send a postcard later. Last year I was disappointed by the food options available at the fair, which weren’t quite worth queuing, so this year I brought my own food (fruits and homemade ham & cheese sandwiches. yum!). This saved me a good deal of money and time. The conference centre the BCBF takes place is in Piazza della Costituzione. It’s about 20-30 minutes from the town centre by bus, depending on traffic. You can get one of those multi-trip discount tickets (10 trips for €12) from ticket centres, bus stations and shops (newsagents, tobacconists, cafés). Warning: don’t keep your ticket in jean pockets. The tickets are so fragile that even slight crease makes them unusable. Sadly I found people were more aggressive and disrespectful this year at the fair. I witnessed some people cutting in queues or cheating (making their friends queue for them so they could go to another appointments or have coffee or something). That was just cheeky! Most of us were patiently waiting no matter how tried, hungry and thirsty. I do understand the ambition to succeed but the fair isn’t a battle field. We are all on the same boat. So be nice. Although there was a big hiccup with my entry ticket (it’s a long story for another time), I had another fantastic time at BCBF. It was grand as my Irish friend would day! I know it’s quality, not quantity, but I was pretty pleased with myself for managing to meet 11 publishers this year. A few meetings went not so great, some went OK and the others went really well! I am very grateful of all the publishers, editors and art directors who generously gave their time to review my portfolio and book ideas. I received some fantastic feedback and am keen to get back on my projects! But most of all, I’d like to thank my wonderful illustrator / author friends (especially my team – Sibba Hartunian, Aileen Crossley, Andrew Gardner and Stephen Hogtun) who made this intense and slightly crazy experience that much more enjoyable. Actually hanging out with these guys was the best part of the whole BCBF experience. A great comprehensive BCBF guide by illustrator Jean Mackey Leblue.